Hi loves! Doing alright today? Hope you have a great weekend ahead of you :-). 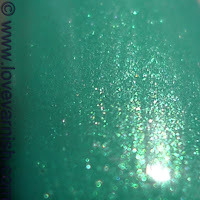 Today I am showing you the only polish I bought during my vacation. There just wasn't that much shopping to do LOL. My wallet was happy! 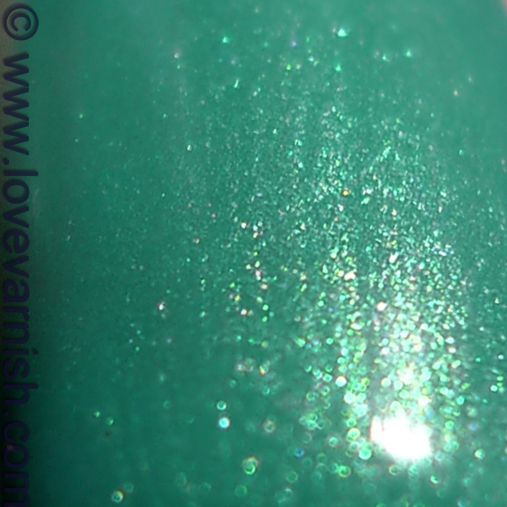 Sixteen 483 is a lovely light teal shade filled with an emerald shimmer. The shimmer is visible but not overpowering, giving it a subtle highlighted look. It applied easy in 2 coats and dried quickly. Also, topped with my favorite topcoat it dries very glossy! There isn't much to say about this polish other than I like it, both for the color but also as a souvenir to a great vacation. Do you like to buy polish on vacation? What is the largest number of polish you ever brought home with you from a trip? The colour you picked is really pretty and looks very good on you! Kind of reminds me of one of my Beauty Uk, though. Thanks Angie! I fell in love with it too :). Yeah I behaved better than last year, when I took home around 25 polishes I believe LOL. Thanks Gwen! Good choice huh? Haha it did feel good to not obsess over polish for a few days ;-). It is one of the best souvenirs indeed! Thanks sweetheart ♥. Btw this polish is really great, amazing colour! Haha yeah mailing stuff home is a great alternative :D. Thanks sweetheart! Thank you Vicky! Yes you should ;-) it is fun! I even found brands I've never even heard of. Yay!